The second class that my Mom and I took during the Sisters, OR quilt week, with our friend Nancy, was Deborah Boschert's "Buds, Branches, Blossoms" art quilt class. I really, really wanted to take this class, so I was super disappointed when we were informed that our initial registrations weren't accepted and the class was now full. Nancy and my Mom managed to still snag spots though, but I could not get in. On our no-class-day mid-week, my Mom and I attended both of Deborah's lectures, which made me want to take her class all the more! After these talks, by a fantastic stroke of good luck, I noticed a sign on the cafeteria bulletin board that said spots had become open in her class -- and were being offered for free! 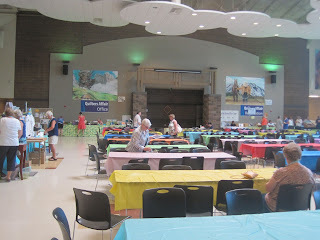 So we were thrilled that we all got to take this class together, on the last day of quilt week -- and with some extra funds available for fabric shopping no less! We had packed not one, but two suitcases of fabric from our stash. Our fabric selections included two or three choices of a "focus fabric" for an art quilt, with coordinating fabrics, in preparation for Deborah's class. But of course the "grass is always greener on the other side of the fence", and I fell in love with a fabric that Nancy had brought called "Animal Spirits" by Sue Coccia. So at the beginning of the class I made a quick decision to design my art quilt around a fussy-cut sting ray from this fabric line. 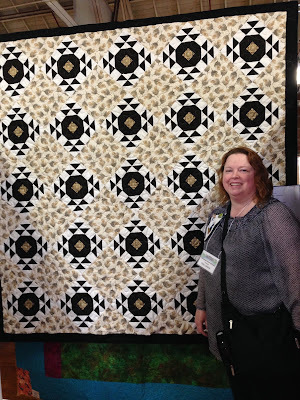 I still LOVE Sue Coccia's art, and have since bought a lot more fabric! Suitcase #1 of fabric stash, exterior. 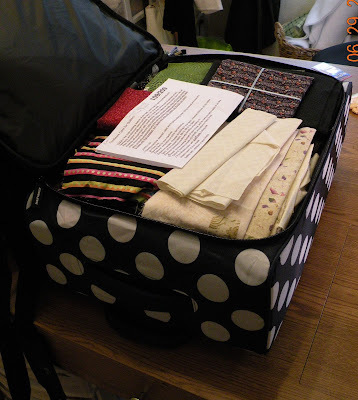 Suitcase #1 of fabric stash, interior. 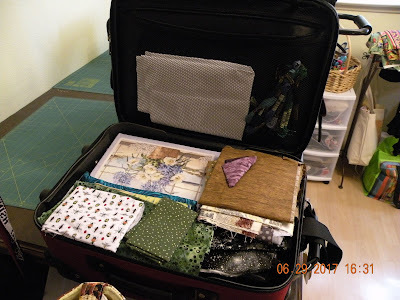 Suitcase #2 of fabric stash, interior ... because you can never have too much fabric, LOL! We had a blast in Deborah's class playing with fabric and designing our first art quilts. 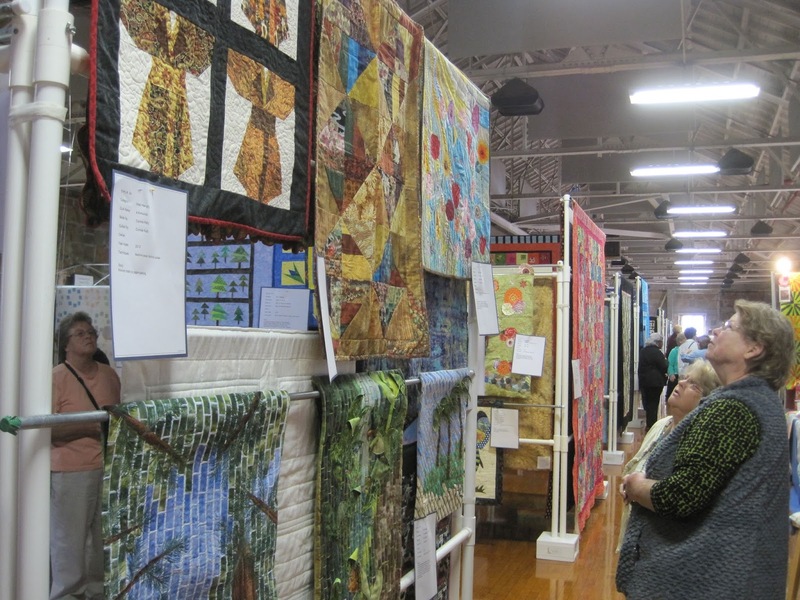 I thought it was the perfect introduction to making textile art. We even learned to make and use fabric stamps, which I had thought I would never be interested in doing. I made a custom Hawaiian maile lei with my stamp, and incorporated it into my piece. My goal for this piece was to capture the feeling and colors of the ocean in Hawaii, along with the graceful looping swimming motions that we'd seen mantra rays do in Hawaii. 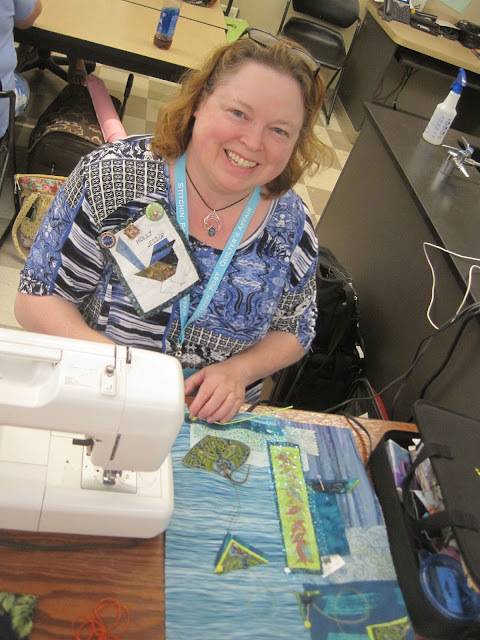 I had several ocean-y fabrics to choose from, including some from one of Marcia Derse's fabric lines that I had bought several years ago when I happened to meet her at the Ann Arbor Art Fair in Michigan. I found a small turtle button for an embellishment, and decided to incorporate some shimmery blue netting that I had in our embellishments stash. 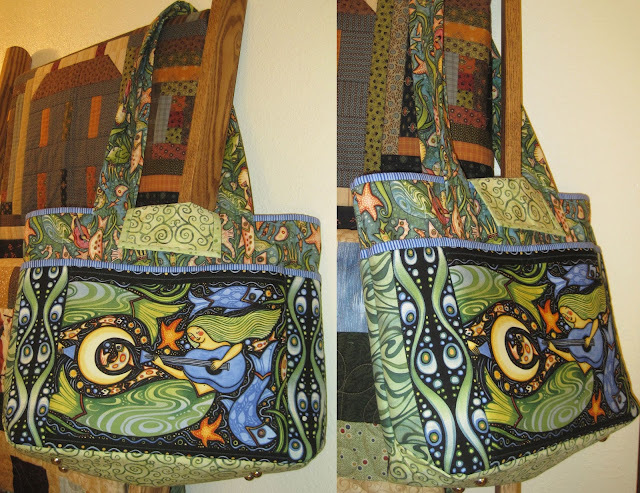 I decided to cut triangular shapes from matching fabrics, to echo the sting ray's shape, and quilted a looping swim path with a green variegated thread. I attempted to learn to make french knots using embroidery thread, but after spending 45 minutes trying to thread the needle, I gave up! 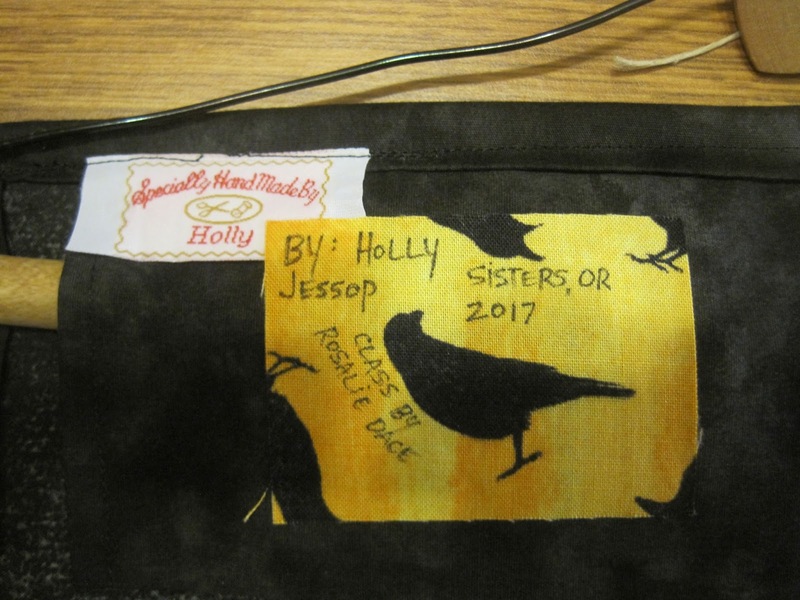 Holly in Deborah Boschert's art quilt class in Sisters, OR July 2017, with art quilt in progress. This weekend -- a very hot and lazy Labor Day weekend in the Bay Area -- I somehow managed to muster enough energy to finally finish the piece I had started in class. 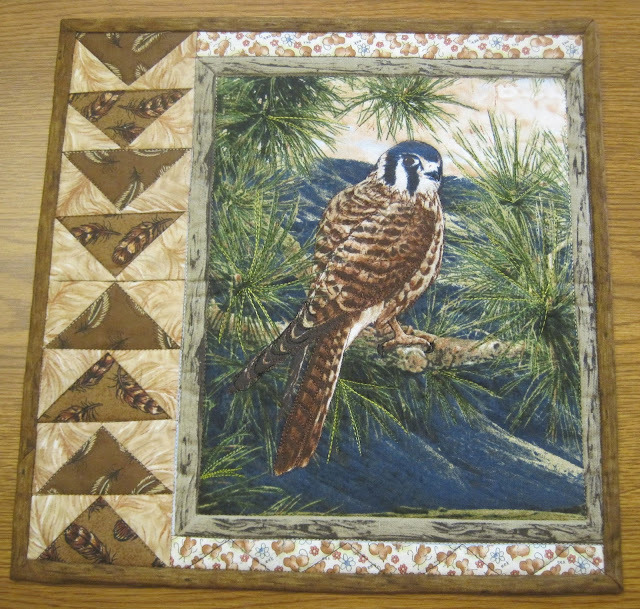 Specifically, other quilting was done around most of the components using a blue variegated thread. Some rays of light through the water were quilted into the lower left corner. I decided to just fuse the sting ray. 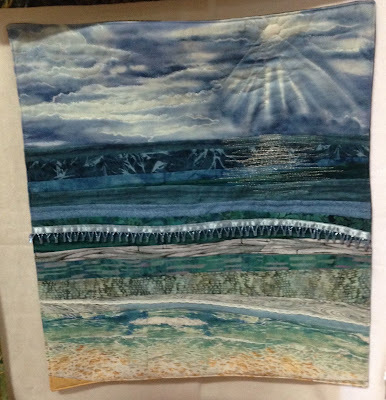 And because I wanted to leave the impression of an uninterrupted open expanse of deep water, I decided not to do any more quilting on the right side of the piece. 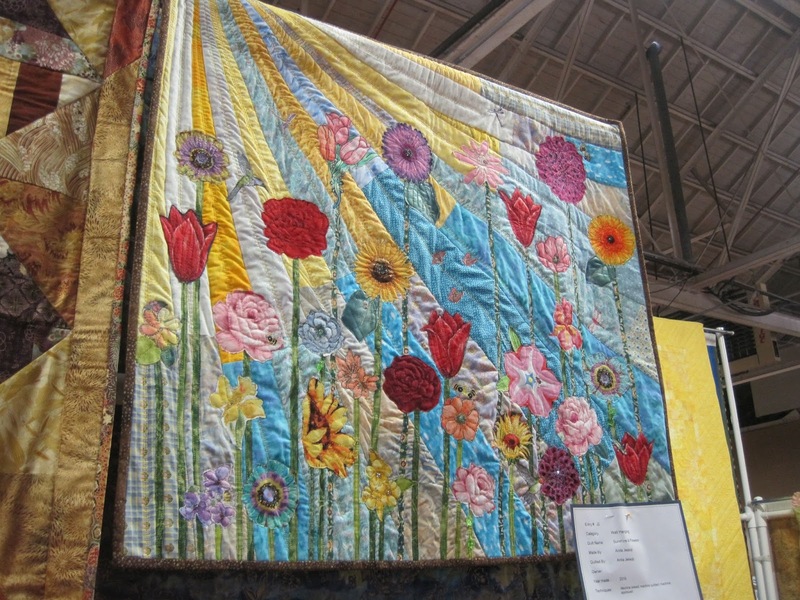 I also decided to try wrapping this art quilt on a pre-stretched art canvas, using a puffy batting, and stapling everything to the wood frame on the back. I really like how that technique makes it easy to hang the piece, which is 16"x20". I like how it turned out, but I wish I had made the looping swim path stand out more. If I were to make another one, I'd try couching a yarn of some such to make that part more noticeable. Finished piece, "Hawaiian Blue", front, 16"x20". 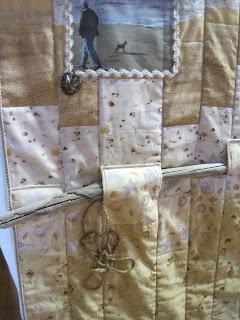 Finished piece close-up, bottom left, with sea turtle button embellishment. Finished piece, close-up upper left. Seriously though, we love corvids -- My Mom collects all things crow & raven, and has a neat Pinterest Board dedicated to corvid art and inspiration. 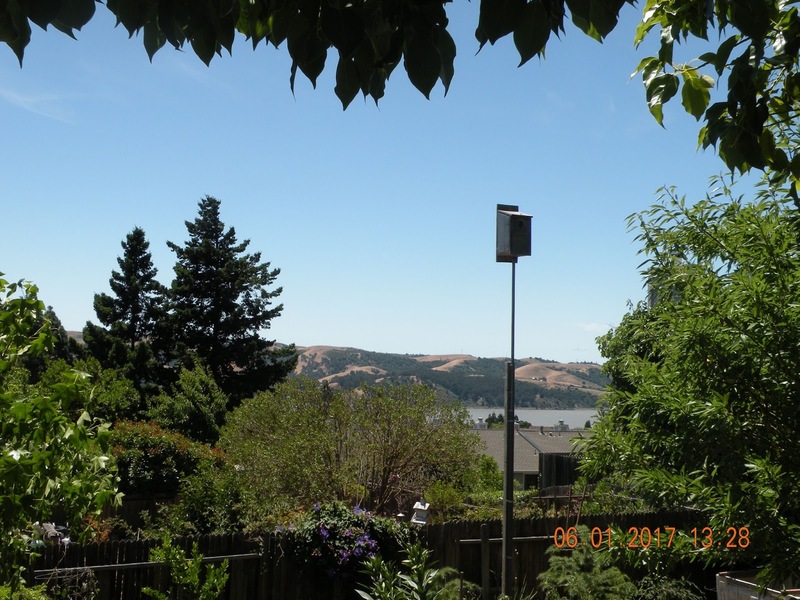 And of course we avidly follow Canuck The Crow, and I have scientific interests in urban wildlife. 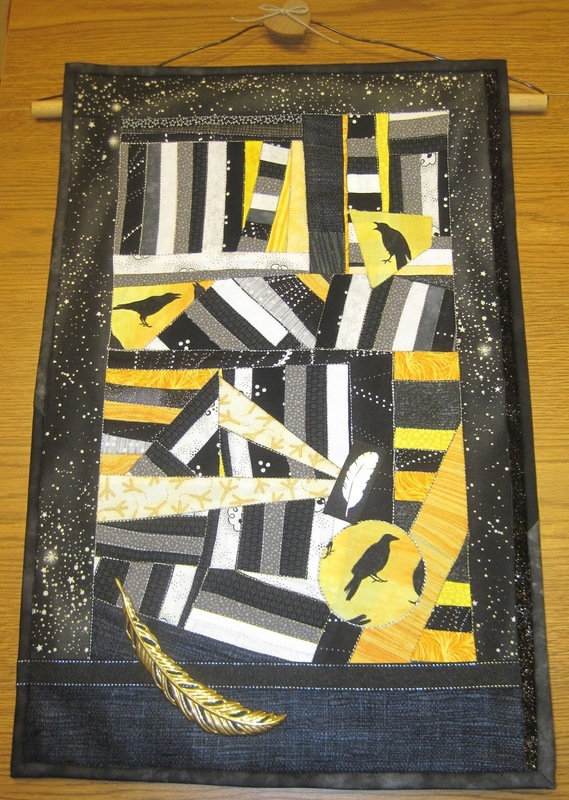 So I turned my classroom assignment into a small art quilt wall-hanging (13" x 20"), as a gift for my Mom. My art quilt features a lot of impromptu/random piecing, inspired by Rosalie's quilt art, which included practicing how to piece in tiny slivers of fabric (a technique that was taught in the class). I also tried piecing some gentle curves, using Rosalie's methods. And also inspired by Rosalie's art, I incorporated a circular element plus some silver and gold elements that included specialty quilting thread, ribbon, and a vintage gold-tone feather brooch. I used Spunbond craft fabric for the batting (which we discovered at C&T's warehouse sale near us last month), to get a very flat & stiff piece overall. I rather like the results, and am calling the piece, "Corvid Night Life In The City". "Corvid Night Life In The City", a small (13"x20") art quilt. Back label on "Corvid Night Life In The City"
The Kestrel nestbox in our backyard. 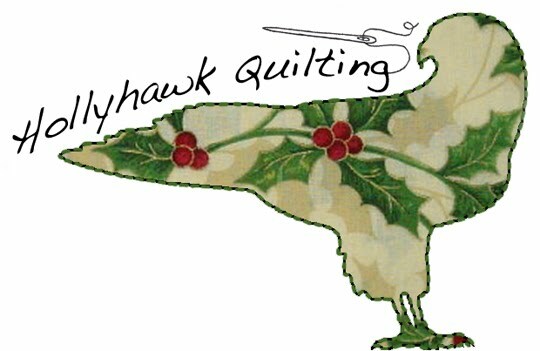 We have a tabletop stand for hanging miniature (12"x12") quilts, and I've been gradually making a mini-quilt to display for each month of the year. 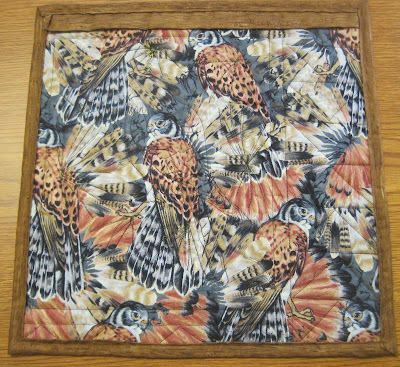 I just finished another one, to commemorate the American Kestrels that have been nesting in our backyard nestbox each of the past four years. They are a small falcon, and we have so enjoyed getting to see them up close. The Kestrel pair usually starts to interact in February, with chicks arriving in May/June ... so I'm not sure yet what month their quilt will be displayed! 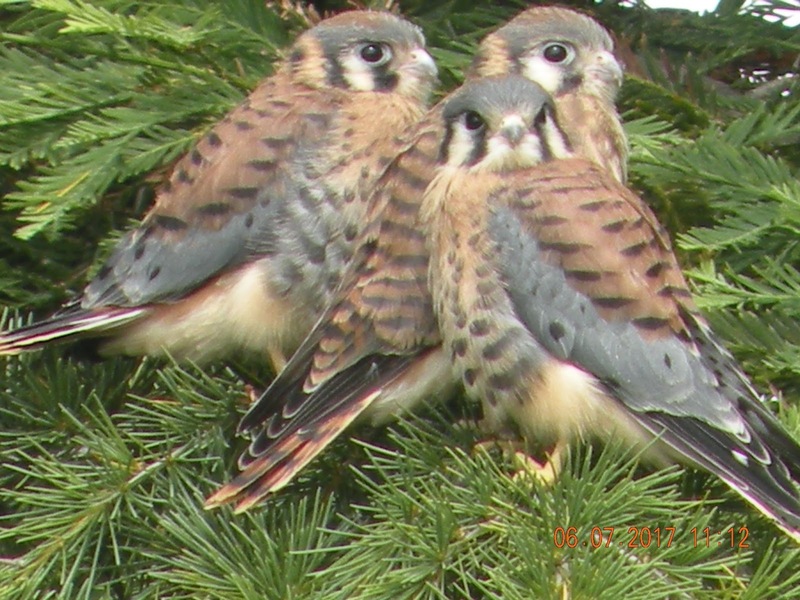 "Our" Kestrel chicks (two boys and a girl), fledged June 06, 2017. 1) This year I finally made a quilt for my own bed. I collected these luscious tropical-green batiks for a number of years, and then arranged them in 5" squares. I got the idea for the light-toward-the-center arrangement from a magazine pattern. 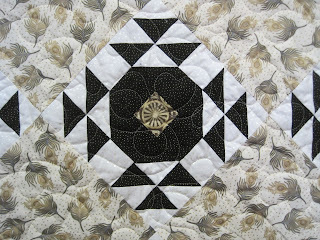 I adore Hawaii's plumeria flowers, and used machine applique to add them. 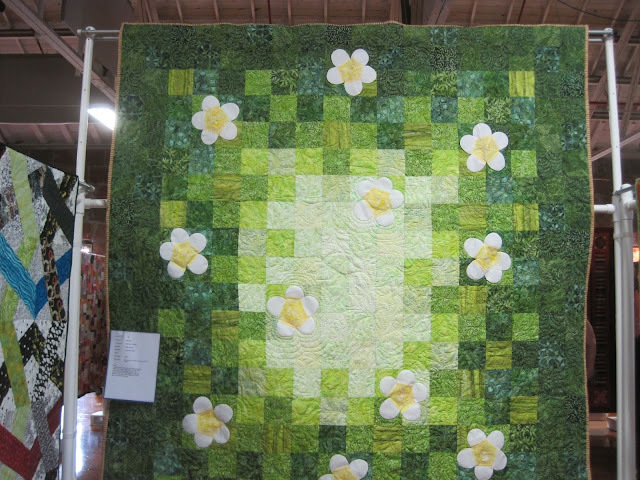 The long-arm quilting was done by Anna MacAllen, echoing the flowers and adding a wandering vine reminiscent of Maile Lei. 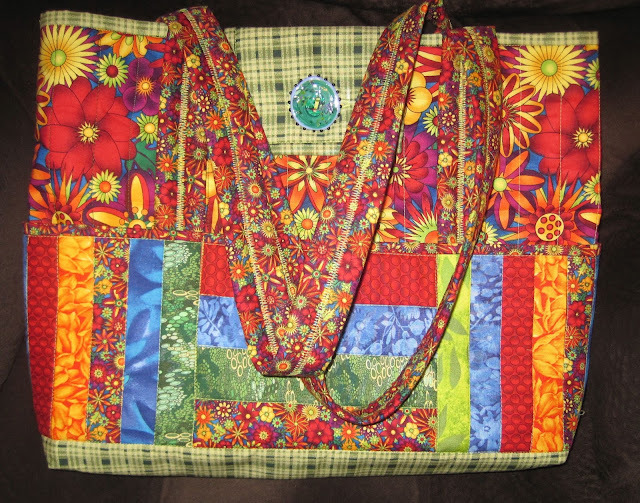 For binding, I chose a fabric with a color and pattern like lauhala mat. Holly's new bed quilt -- "Hawai'i Flowers"
1920's quilt made as a gift for a coworker who got married last May. 4) Holly's "Bodega Bay Memories": This is a wall-hanging art quilt that incorporates pictures (printed onto fabric) from some of our many trips to Bodega Bay. 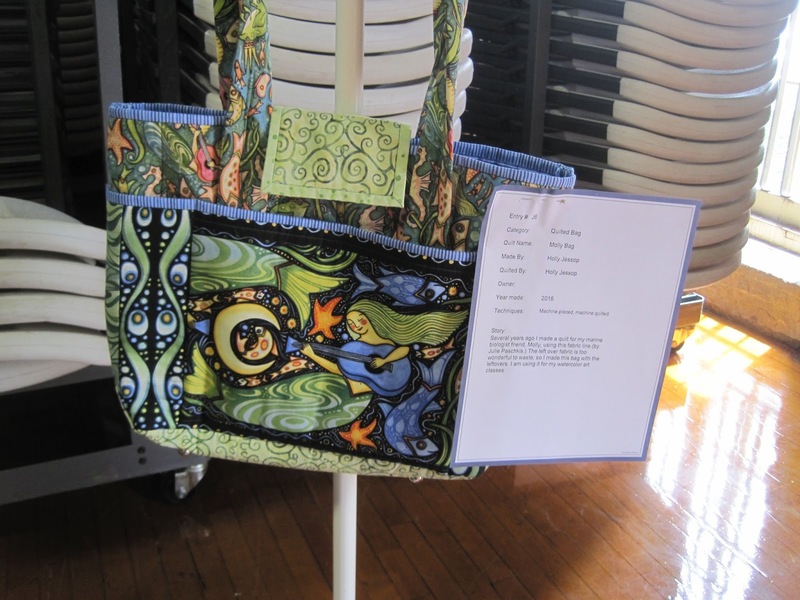 We'd had this set of coordinating beach fabric for a long, long time ... and when I saw it used in a book on bargello quilts ("Instant Bargello", by Susan Kisro) I thought it was the perfect project. But, when I made the quilt it did not come out straight (I think because I made the mistake of not alternating my seam sewing and pressing direction)! 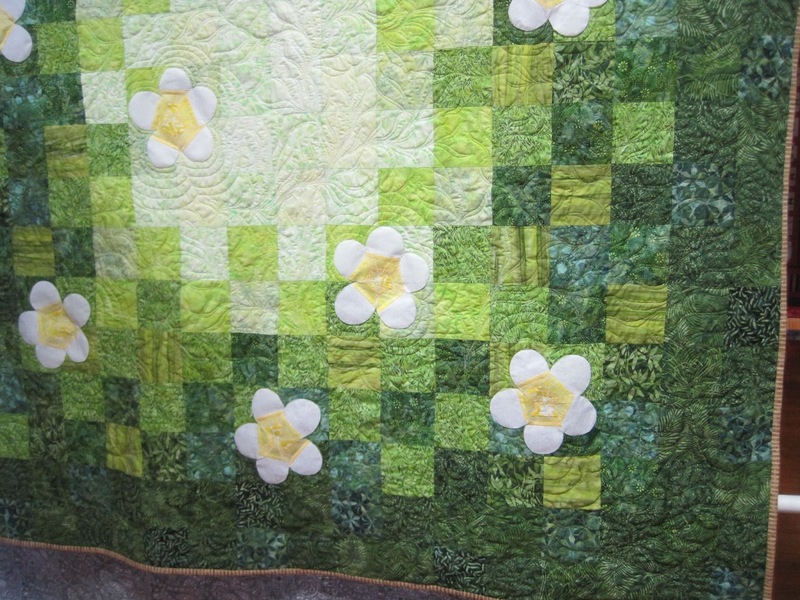 Also, it seemed kind of plain (I wasn't confident enough to do more than just stitch-in-the-ditch quilting). So, I turned a mistake into art: I separated the lower half from the upper, and rejoined them higher up such that it would hang straight, and incorporated a piece of drift wood decoration along the join. 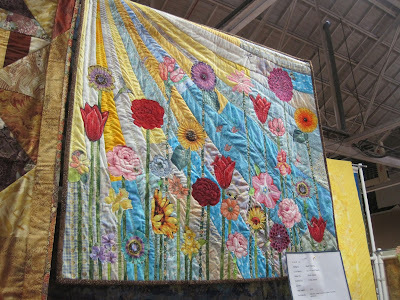 I still felt the piece needing something ... and I happened to flipping through one of the books that we got at a C&T Publishing warehouse sale (held annually near us in Concord, CA) entitled, "Innovative Fabric Imagery For Quilts", by Cyndy Lyle Rymer. 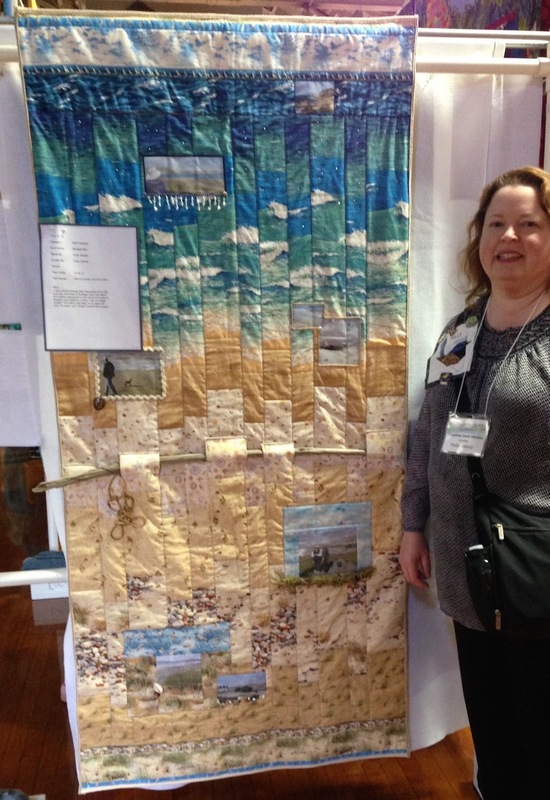 Her "Virtual Family Reunion" quilt was the perfect inspiration! So to make the piece more interesting I added the pictures and embellished them. There's ribbon, beads, shells, rocks, drift wood, and a sailor's knot that my Dad tied for me. 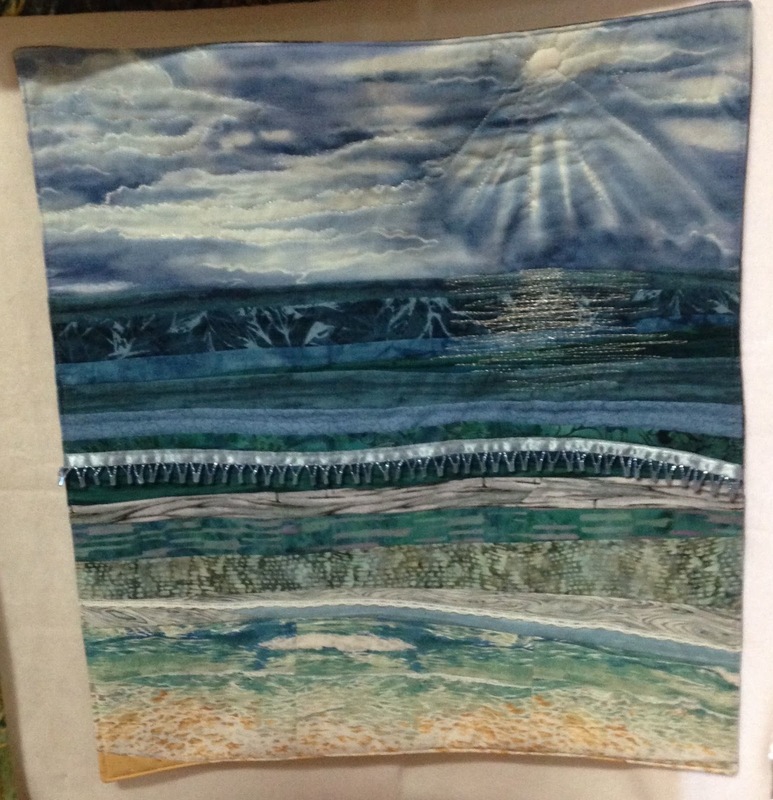 My other lesson from this piece was regarding use of fusible for the pictures -- with it, they show the quilting seam that's beneath. 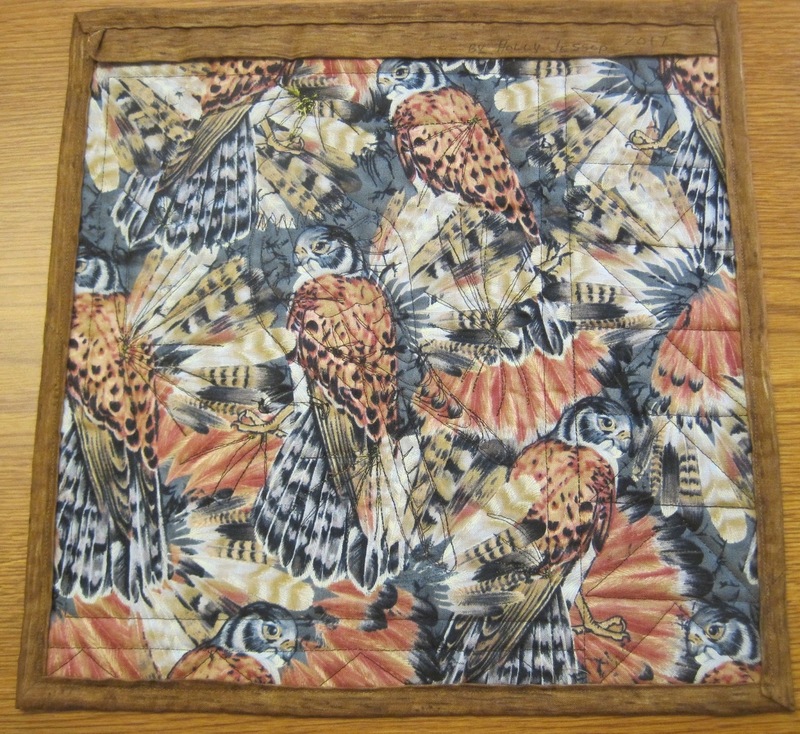 Instead, it would have been better to sew the pictures pieces on around the edges. I'd also like to press the piece a bit before it gets hung in our family room. 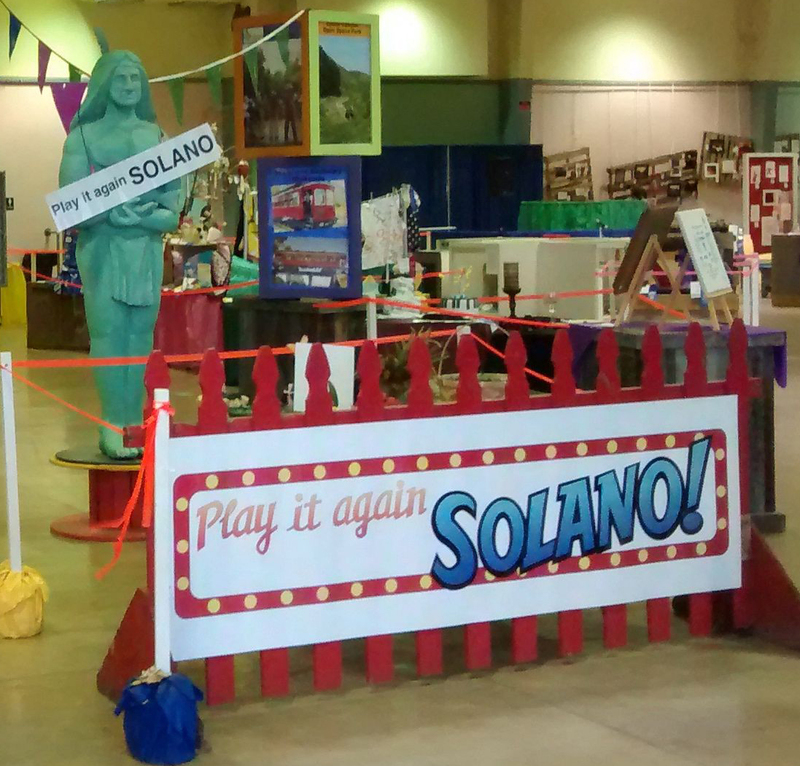 I was honored that they put this quilt at the top of the stairs, at the entrance to the show. "Bodega Bay" close-up. The picture is my Dad with our Ginger when she was a puppy. 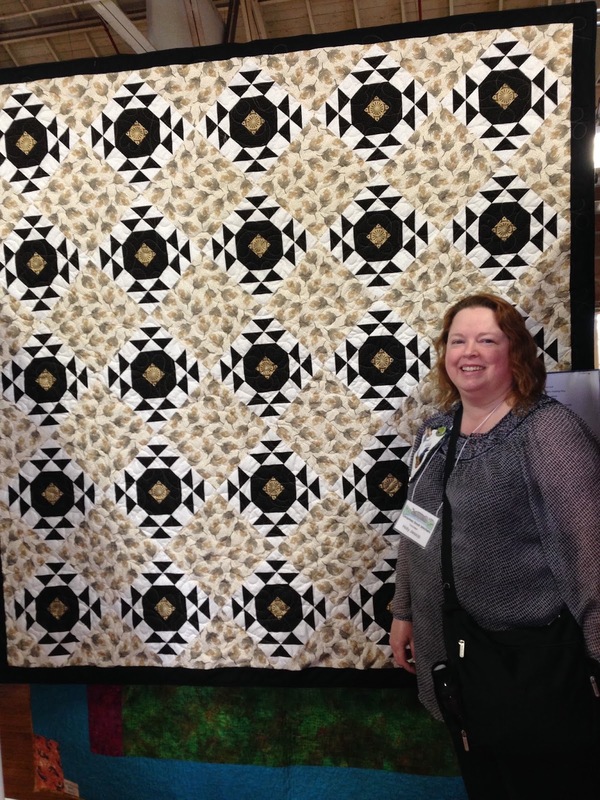 Anita showing her Sunshine & Flowers quilt. 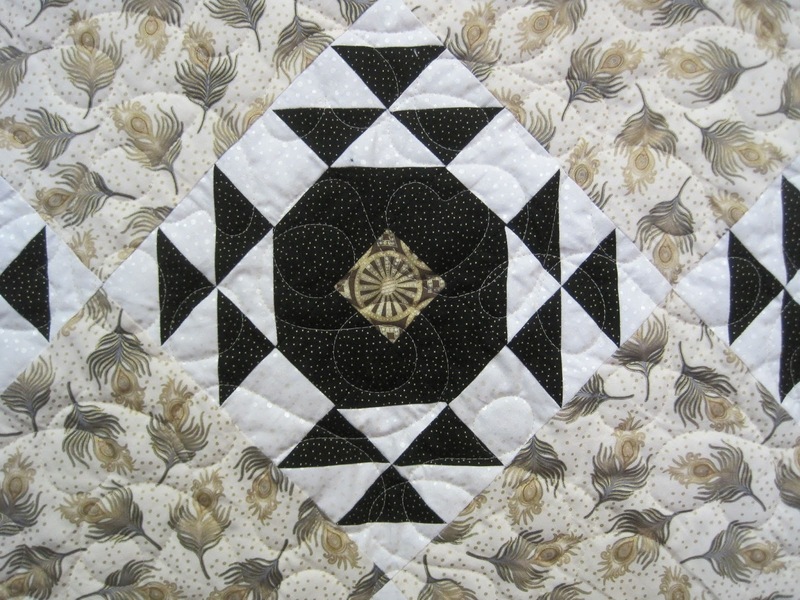 To be able to match the border pattern in Molly's quilt, I had bought extra fabric (Molly's quilt was made for a friend's 35th birthday in 2010, with Julie Paschkis fabric I had found in a quilt shop in Michigan). 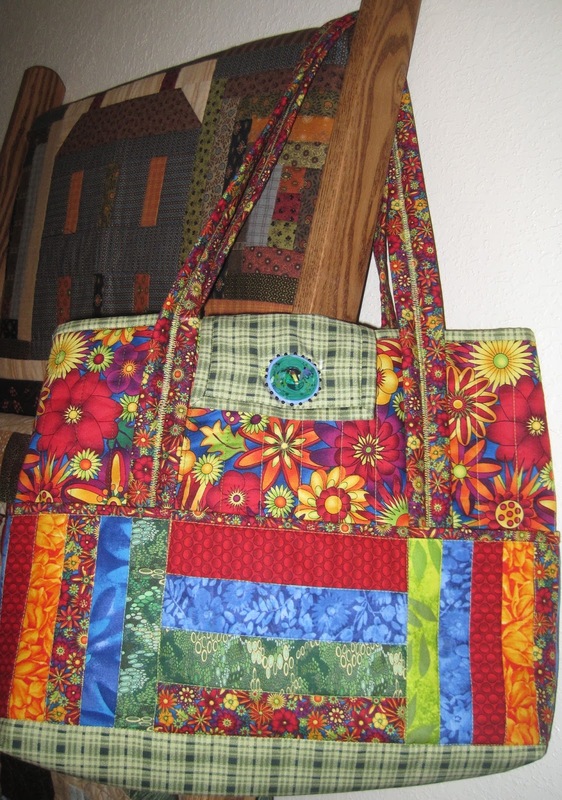 It's a fabric that I still absolutely LOVE, and I finally found something to do with it: Another shoulder bag! I think it came out super-cute. 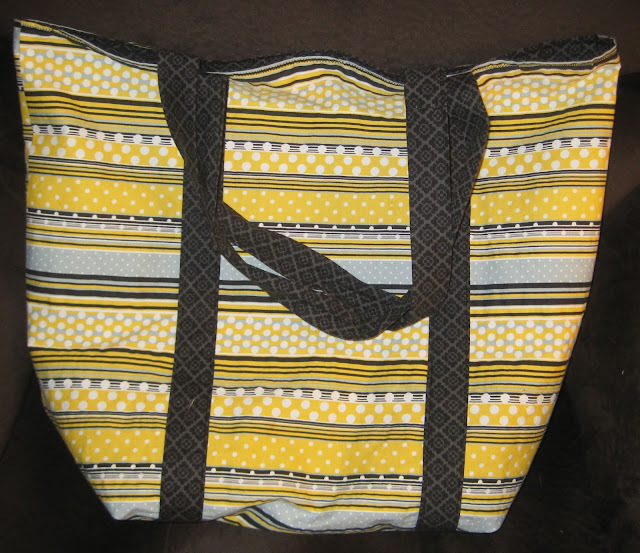 It's a little bit larger than the shoulder bag that I made last month. 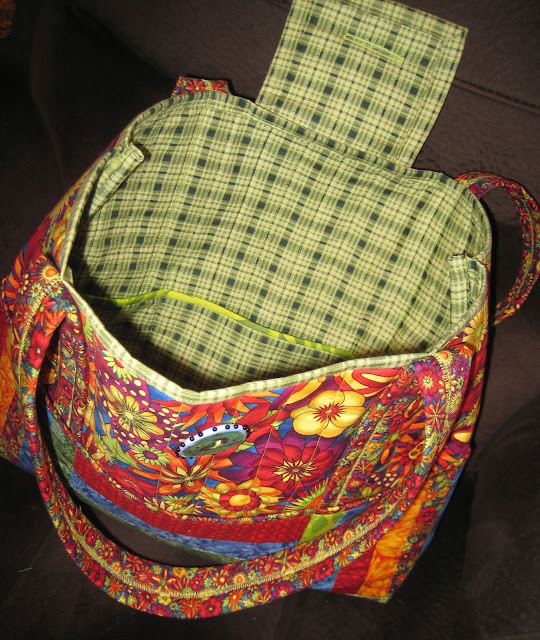 This one has a pair of inside pockets, a magnetic closure on the flap, and "feet". Little Mr. Aerie Parrot sometimes like to sew with us. 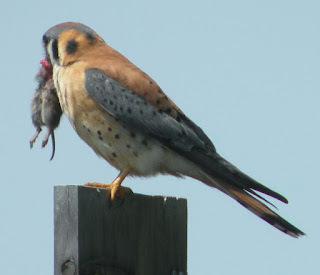 Here he is "helping" his Grandma-bird. 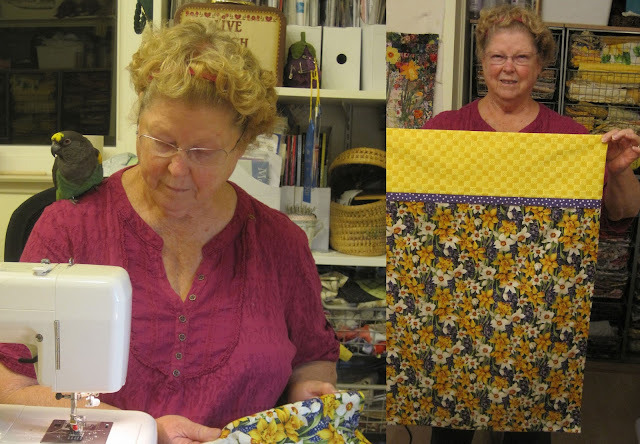 Despite lots of input from him on the fabric selection and sewing, she managed to start and finish this pillow case in one evening(1) -- which is another "extra" quilt fabric recycling project. Aerie Parrot and Mom sewing a pillow case, 8/24/2016. And finally, we are making lots of shopping bags, which go together quite quickly now that we're familiar with the pattern. They are fully lined, with straps that go completely around. We're mostly using our long stored away "trash fabric" (cotton/polyesters), which should wash and wear well. Shopping bag made by Holly. This year's Fair theme: Play It Again Solano! 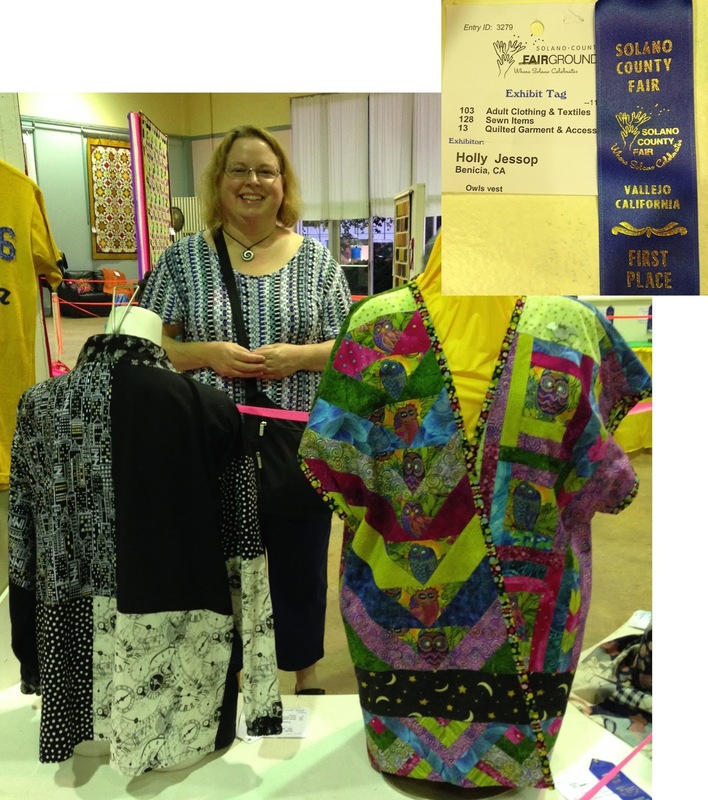 Holly with her quilted Owls vest (on right), which won a 1st Place ribbon. 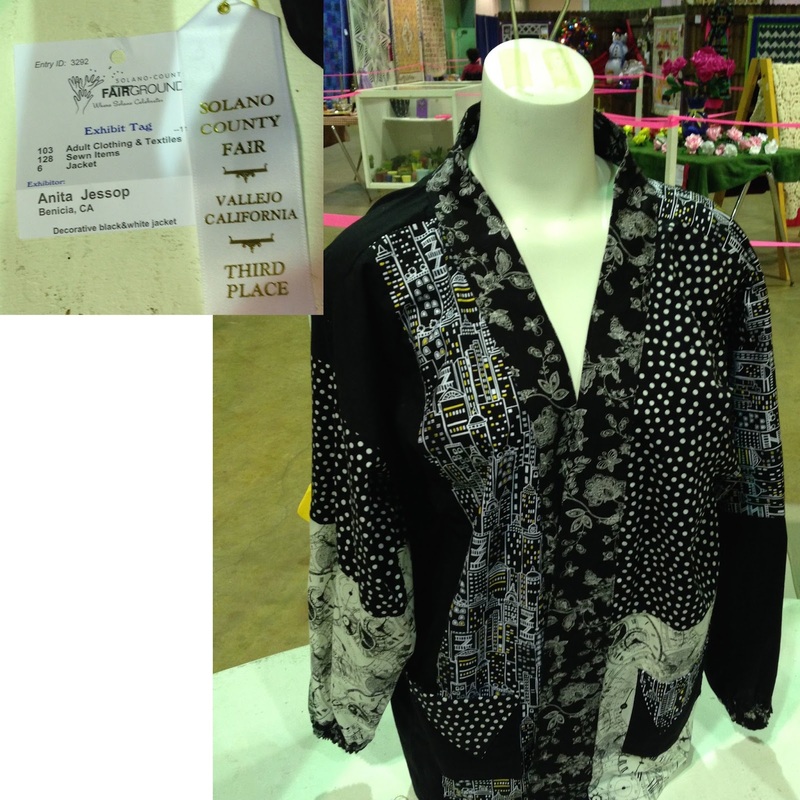 Mom's black-and-white pieced jacket won a 3rd Place ribbon. 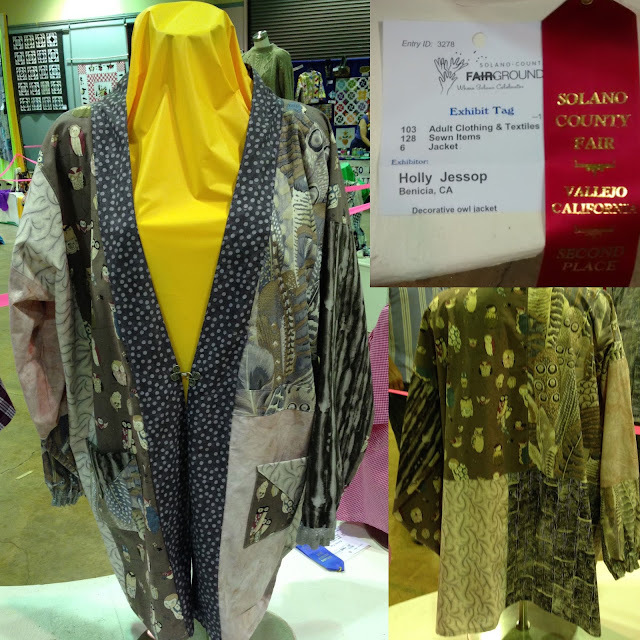 Holly's pieced Owls jacket won a 2nd Place ribbon. 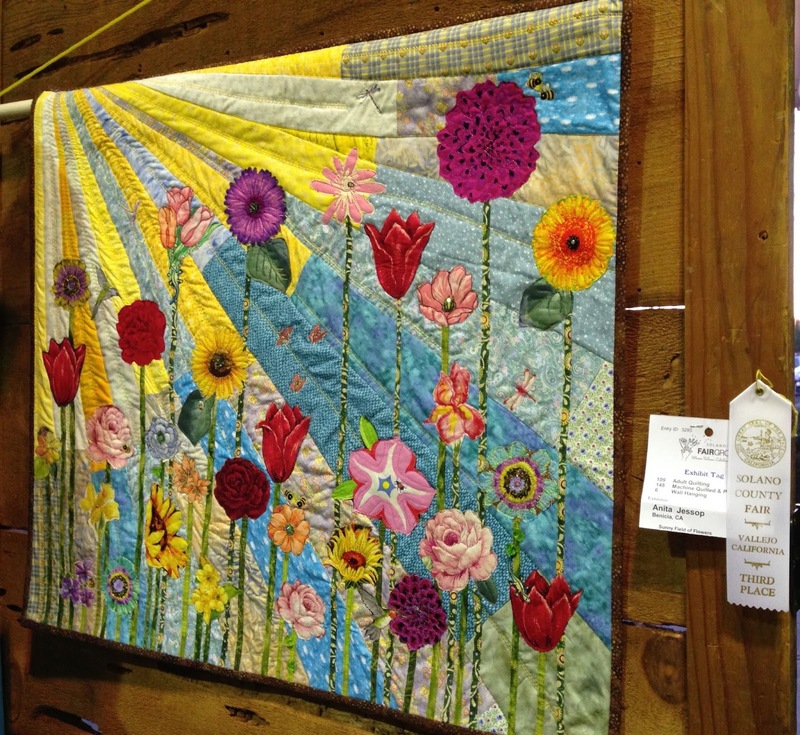 Mom's Sunshine & Flowers quilted wall-hanging won a 3rd Place ribbon. 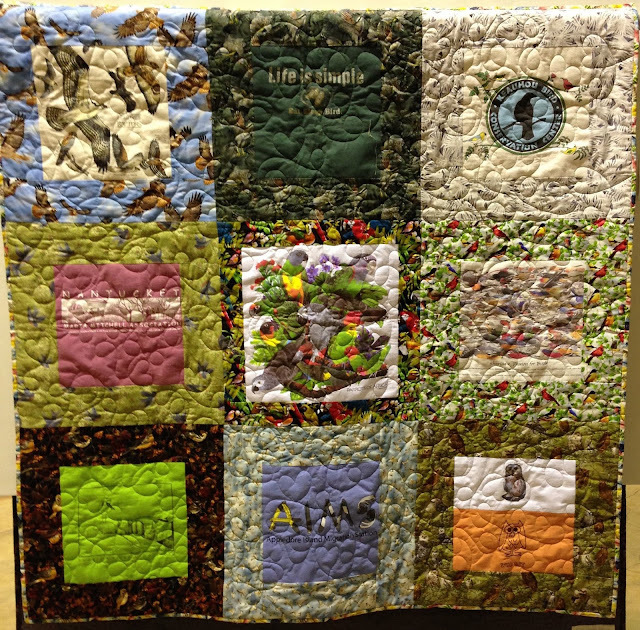 Holly's All-About-Birds T-shirt quilt. Each birding T-shirt is surrounded by a coordinating bird-themed fabric. The quilting is a bit distracting (although it looks better in person) ... but, I think I will have future T-shirt quilts long-arm quilted a bit differently. After a long absence from sewing, I felt inspired this weekend to work on some quilted bag projects. My Mom had purchased and started this kit, about ten years ago, and today I finally finished it (another UFO converted to a FO!). I quite like the pattern (once I figured out the crazy directions) and may make more of these! A large purse-sized bag, with three exterior pockets in each side. The interior has one side with pockets, divided into three sections. 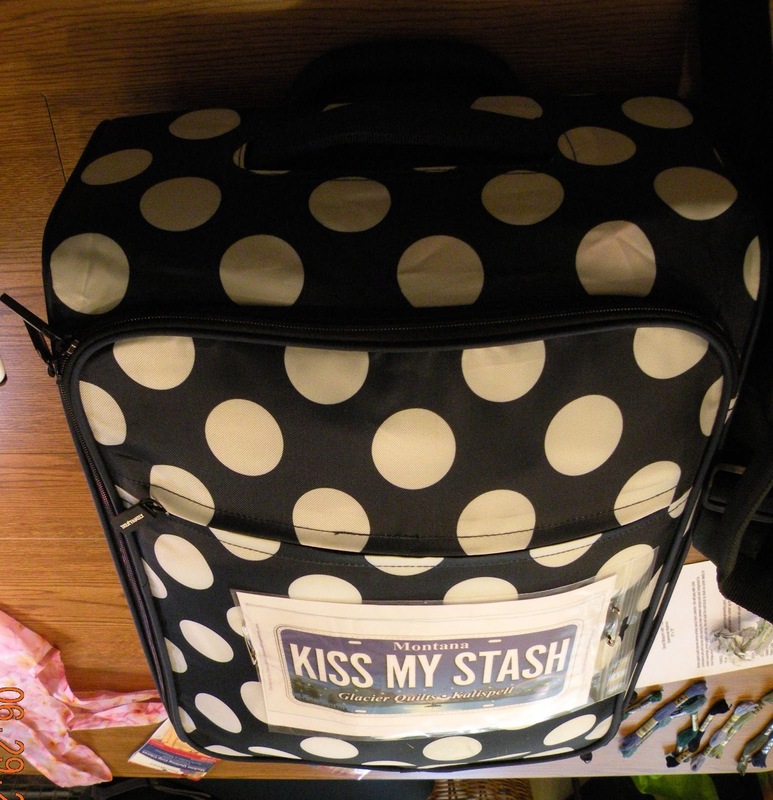 Next time I might add some zippered pockets, and/or pockets on both sides. The button is a whimsical piece out of fused glass, with lots of black knobs all around. (c) Holly Jessop 2012. Simple theme. Powered by Blogger.